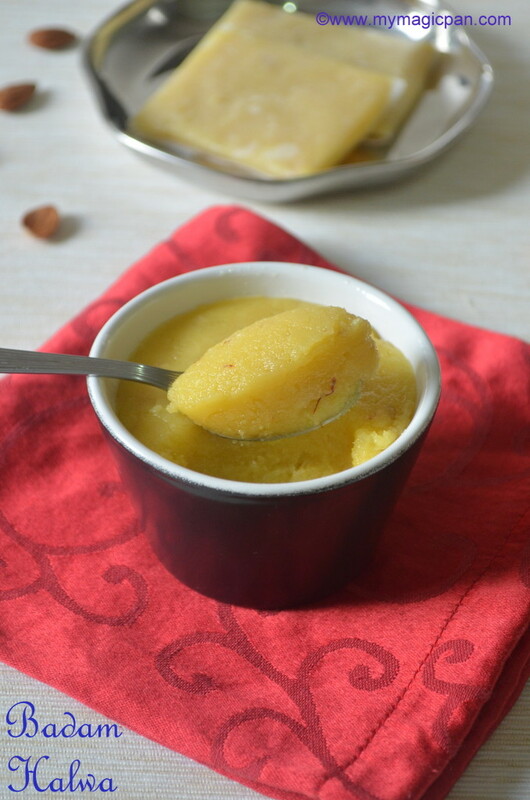 Badam Halwa is a rich and delicious sweet made with almond paste, sugar and ghee. 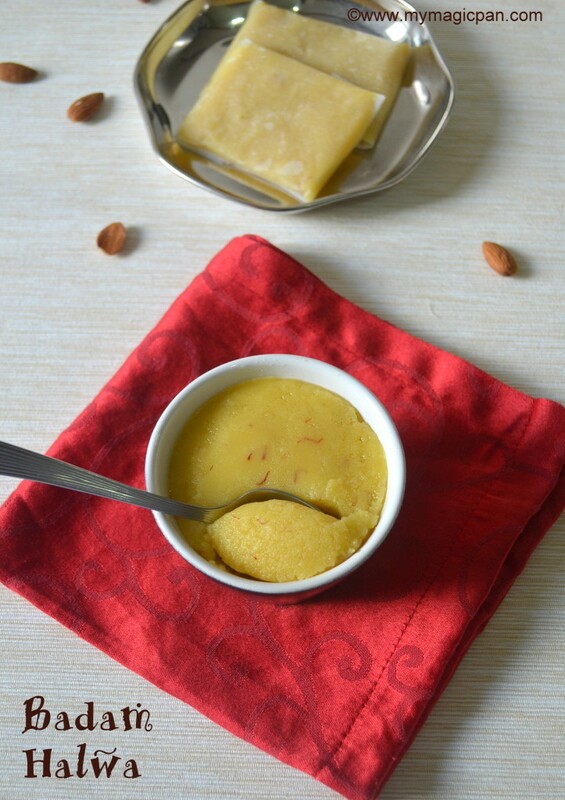 There is no sugar syrup consistency needed in making this Badam halwa. Is it not good news?!? 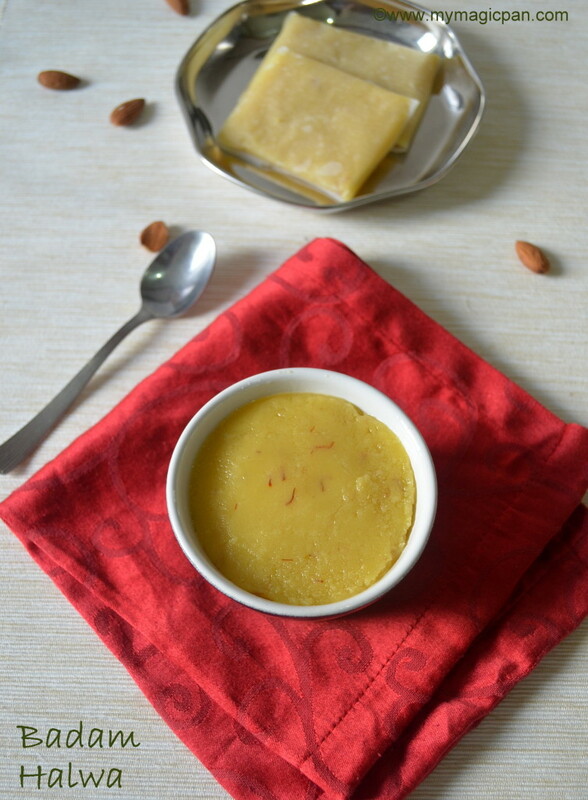 Unlike other sweets, this Badam Halwa does not need a lot of ghee. 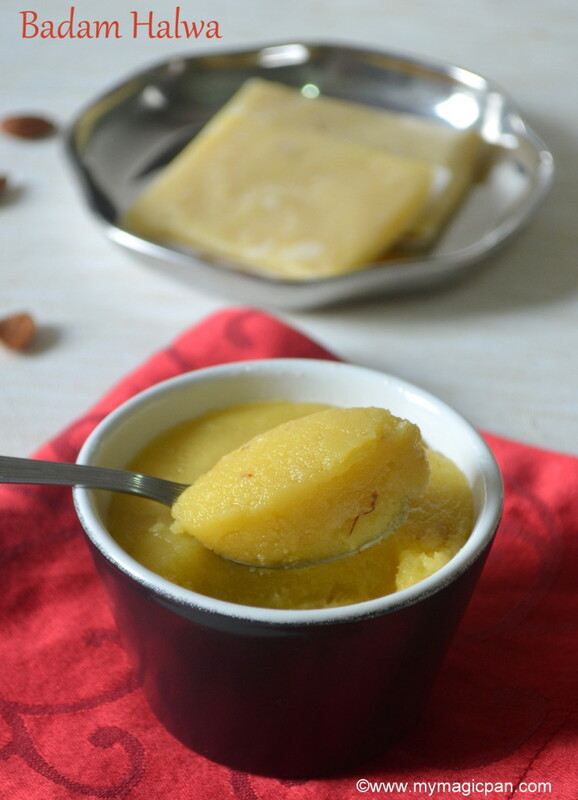 I have posted a Badam Burfi recipe earlier. Its a microwave version. 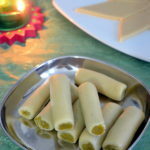 Kaju Katli is yet another favourite of mine. Try anyone of these if u are a fan of cashew/badam based sweets. 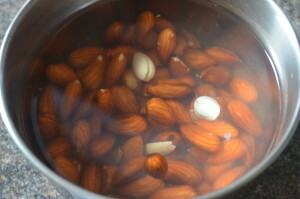 Soak badam for 2 hours, u can soak it overnight too. The skin can be peeled easily now. 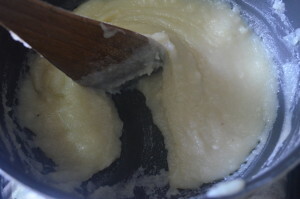 Remove the skin and grind it into a smooth paste. 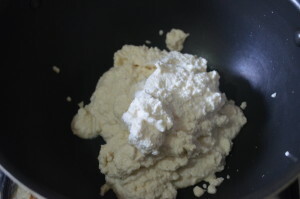 Heat a pan and add the almond paste. 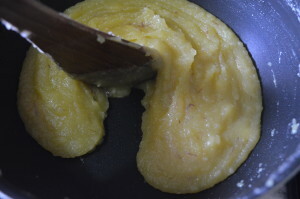 Cook the badam paste in low-medium flame until u get a nice aroma. This might take around 5-6 mins. 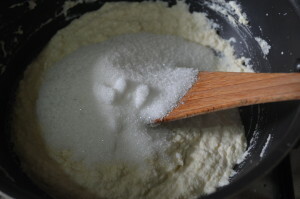 Now add the sugar to it. 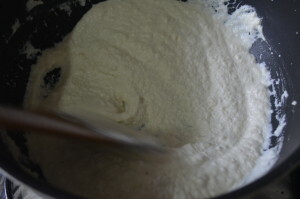 The whole mixture will become watery. Continue to cook in low-medium flame. It will start getting thicker. 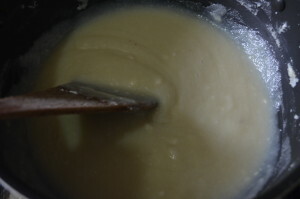 Add saffron soaked milk to it and mix. Start adding ghee in batches. 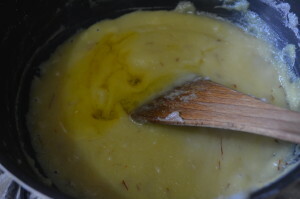 At a stage it will absorb all the ghee, thicken and start leaving the sides of the pan. This is the right stage. Switch off the flame. Thats it!! Badam Halwa is ready!! Soaking the badam overnight helps in peeling the skin very easily. 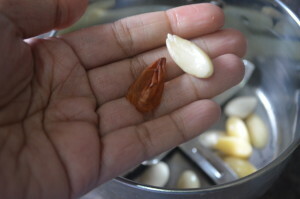 Alternatively u can boil the badam in water for 2-3 mins too. 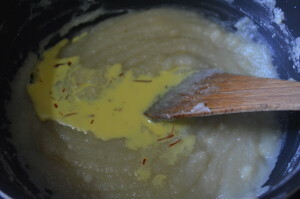 Soak saffron in warm milk for a few mins and then add it to the Badam Halwa. It gives a nice flavour to it. U can adjust sugar according to your taste buds. 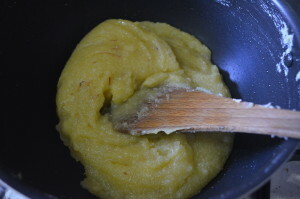 The Badam Halwa will become thick after cooling. So switch off accordingly. 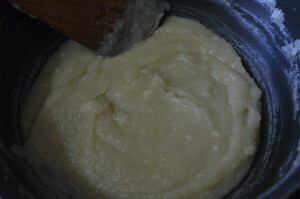 U can grind the almonds into a smooth paste or slightly coarser, depending upon the texture u want your Badam Halwa to be. Keep the flame in low-medium & stir continuously, else it will get burnt very easily. Unlike other sweets this does not take a very longer time. 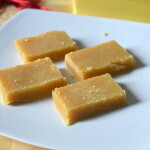 I love badam halwa and yours look fantastic and delicious. 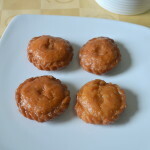 Looks so yummy…..we use to have this a lot in our childhood days. Thanks for sharing the recipe. Where can we get the sheets in which they are folded. What paper is that called? Thank u 🙂 The sheet is called parchment paper or baking sheet. Feel like digging in. Looks amazing and the photos are lovely!! 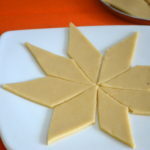 delicious perfect badam halva..pass me that bowl this side please..